Earning a master's degree in missions is the first step toward the vocation of world evangelism. A degree in missionary studies can equip you with the biblical and theological knowledge you need to understand your faith, along with the skills to communicate across cultures. With your degree, you can take on roles in local churches, educational settings, or parachurch ministries. The Bureau of Labor Statistics (BLS) projects that social and community managers will see an 18% increase in jobs between 2016 and 2026. Missions majors can expect many potential openings in organizations committed to serving the kingdom, the church, and the world. Learning how to become a missionary involves more than studying theology and biblical knowledge. It also means understanding cultures, geopolitics, languages, religions, communication tactics, and leadership skills. For many would-be missionaries, it requires building an appropriate academic background to become English teachers, entrepreneurs, or international development workers. Students can concentrate in areas like Muslim studies, teaching English as a Foreign Language, justice and development, global leadership, or linguistics, allowing future missionaries to tailor their academic programs to meet their goals. Often, master's degree in missions programs include core courses drawn from theology, biblical studies, and anthropology. Some degrees make ministry or divinity the core of the program and missions a concentration. An M.Div. with an emphasis in missions can take 90 credits to complete, while a seminary degree in missions may require 60 credits. A liberal arts college or Bible college often offers a mission degree for just 33 credits. A missions program usually requires an internship and a thesis. The internship takes place in an international or cross-cultural setting, and students in some schools can substitute a practical capstone for the thesis. 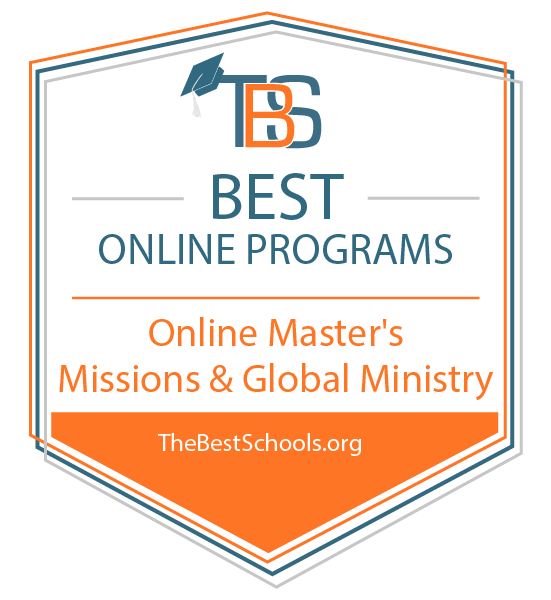 What Else Can I Expect From an Online Master's in Missions & Global Ministry Program? 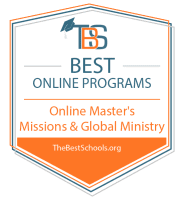 Online Master's in Missions & Global Ministry Degree Program Ranking Guidelines: We selected the degree programs based on the quality of program and range of courses provided, as well as school awards, rankings, and reputation. Founded in 1956 by the Churches of Christ, Rochester College provides academic programs based on Christian values, inclusion, and scripture-based leadership. Rochester College in Rochester Hills, Michigan, offers an online master's of religious education missional leadership (MREML) built on biblical, theological, and pastoral principles. Rochester's 36-credit MREML program includes 24 credits of online coursework and 12 credits of onsite work. One week each semester, learners come together on campus or at an external site to interact with peers and instructors in seminars and intensive classroom exercises. Rochester's online MREML embraces the principle that mission leadership develops from congregational experience alongside foundational coursework. Students remain in their ministry setting while completing 12 hours in theology and history, 12 in biblical text, and 12 in Christian leadership. Instructors in the cohort-based program include missionary professionals from around the world who serve as mentors. Rochester College is regionally accredited by the Higher Learning Commission. Affiliated with the Churches of Christ, Abilene Christian University in Abilene, Texas, offers undergraduate and graduate programs to learners around the world. ACU, founded in 1906, moved to its current location in 1929 where its dedication to both innovation and Christian ideals remains strong. ACU's online master of arts degree in global service includes 48 credit hours of coursework. Through classes incorporating principles of theology, sociology, communication, and anthropology, learners develop the critical-thinking and analytical skills needed to serve as Christian leaders in a global society. Students study global issues, intercultural relations, and innovative service from a Christian perspective in online courses and four one-week residencies. Learners participate in interactive and contextual exercises as they receive mentorship and train for ministerial leadership positions. Students can work with an adviser on a thesis or submit an e-portfolio for degree completion. Abilene Christian University is regionally accredited by the Southern Association of Colleges and Schools Commission on Colleges. Based in Bloomington, Minnesota, Bethany Global University offers three master's degree programs for learners who want to expand their knowledge of spirituality and Christian leadership in an intercultural context. Bethany's online master's degrees in missions include thesis and non-thesis tracks. Both degree plans include 36-credit hours. Learners that want to pursue doctoral study or teach in an academic setting should pursue the thesis option. In Bethany's intercultural ministry studies master's degree, learners study cross-cultural communication, anthropology, and church-planting models and practice. The online master's in intercultural ministry leadership includes coursework in biblical and spiritual foundations of leadership, intercultural studies, and the Bible and theology. The online master's in intercultural ministry education emphasizes effective teaching, training, and curriculum planning alongside coursework on intercultural interaction, theology, and communication. Bethany Global University is nationally accredited by the Association of Biblical Higher Education (ABHE). What Else Can I Expect From an Online Master's in Missions and Global Ministry Program? A degree in missionary studies includes courses in theology, biblical studies, anthropology, and ministry practice. Students can choose a degree focused on theology, one that equips them with a skill such as teaching English, or one that concentrates on a specific culture. Students of Muslim studies learn to analyze the theologies, traditions, and worldviews of Islam using cultural and theological tools of analysis. Courses include an introduction to the Koran, along with an appropriate internship and thesis. Upon graduation, students can take roles in government, business, or mission organizations dedicated to reaching the Muslim community. Learners in this concentration prepare to teach English to children and adults in a variety of academic, cultural, and linguistic contexts. Courses include advanced grammar; introduction to syntax; and teaching reading, writing, and grammar. Learners prepare to enter the growing EFL field at universities and freestanding language programs around the world. This concentration prepares local church and parachurch leaders for strategic leadership roles and equips students to nurture others into leadership. Students explore the spiritual disciplines of leadership, global trends in leadership, and how to develop leaders in a multicultural setting. Missions, globalization, and development fundamentally change local cultures. How can missionaries work within a local culture to help smooth its adaptations to powerful forces of meta change? Contrasting and diverse cultures deploy distinct leadership styles. In this course, students learn how their cultures influence their understanding of leadership, and they explore multiple cultural views of leadership. This course is a sociological and religious study of the nature of culture and worldview. Students review biblical cultures and worldviews and consider Christianity in light of today's cultures and worldviews. Students examine biblical texts to uncover a theological framework that supports, defines, and empowers missions. Using scripture as a lens, learners consider historic and modern theories of missions. Using a Trinitarian ecclesiology, this course focuses on the practice of leading a spiritually transformed and transformative group that embodies meaningful relationships and operates in the power of the Spirit. Earning a master's degree in missions can open up positions in government, missions agencies, schools, churches, and research institutions. Missiologists can even serve as intercultural or multicultural coordinators for multinational corporations. Some majors equip students with entrepreneurial skills to start their own business-as-mission enterprises, or to help established agencies innovate in culturally sensitive ways. Social and Community Service Manager: A degree in missions can equip students for leadership positions in nonprofit agencies or national and international parachurch ministries. These positions typically require skills in multicultural team development, intercultural communication, and large-scale event planning and execution. Mission or Outreach Pastor: Large churches often add a mission or outreach pastor as one of the first staff positions after filling age-related ministry roles. Those with a degree in missions may also serve as full-time senior pastors depending upon the ordination requirements set by their church or denomination. Postsecondary Teacher: A master's degree in missions is required to teach the subject at a Bible college, a liberal arts college, or a seminary. While most schools prefer a doctorate, a master's degree and experience can substitute, and in some institutions, part-time professors can also work in nonclassroom positions, like internship coordinators.